Cardea face the camera before a 4-4 draw at Thorpe Wood Rangers in Division Three of the Peterborough League, back row, left to right, Junior James, Matt Robinson, Kieran Hart, Sam Ekins, Gav Earl, John Reddell, Tony Harper, Tom Rimes, Aaron Yeoman, Dan Gibbs, (front) Luke Stephenson, Kaylum Clark, Jon Saunders, Luke Penman, Mike Dondrilli, Dom Di Rienzo, Ashleigh Baldwin and Sam Cope. Peterborough Premier Division leaders Moulton Harrox were pushed all the way by bottom club Langtoft United before easing into the second round of the President’s Shield on Saturday (September 9). Harrox emerged from a tough scrap 2-1 winners thanks to goals from Louis Steadman and Dan Woods. Thorpe Wood Rangers battle it out in the Werrington rain. Photo: David Lowndes. Big city guns Peterborough Sports Reserves and ICA Sports made more comfortable progress with three-goal wins over Leverington and Ketton respectively. It’s been a slow start to the league season for reigning Premier Division champions Peterborough Sports who are bedding in a new manager and several new players, but they saw off Leverington 4-1 at PSL thanks to goals from Lewis McManus (2), Jack Eldridge and Jack Barron. It was 3-0 for PFA Senior Cup holders ICA at Ketton with Lewis Glover, Sam Cross and Andy Wayte the men on target. Holbeach United Reserves needed extra-time to edge a seven-goal thriller at Warboys Town, while Sawtry won 4-2 at Deeping Rangers Reserves. Luke Ball scored twice for Stamford Lions at Skegness United. Adam Scott and Tom Floremce scored the goals for Thorney in a 2-0 win at AFC Stanground Sports. Peterborough Polonia lost their unbeaten record in Division One as they went down 4-2 at Wittering Harriers. Cardea were knocked off the top of Division Three after losing thier 100 per cent record in a 4-4 draw at Thorpe Wood Rangers. City rivals Feeder are now top after winning a fourth straight game. They beat Whittlesey Athletic 3-1 with goals from Josh Rosser, Jake McGuinness and Lewis Bradley. In-form top-flight side Stamford Lions lost 4-3 at Skegness United in a Lincs Cup tie despite two goals from Luke Ball. Lions were 2-0 and 3-1 down before levelling at 3-3, but a fourth Skegness goal on 51 minutes proved decisive. Crowland Town and Long Sutton Athletic won their ties. Tom Gosling struck a hat-trick in Sutton’s 5-0 win over Fishtoft. President’s Shield: AFC Stanground Sports 0, Thorney 2 (Scott, Florence); Deeping Rangers Res 2, Sawtry 4; Ketton 0. 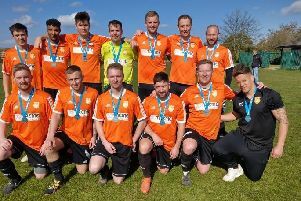 ICA Sports 3 (Cross, L. Glover, Wayte); Langtoft United 1, Moulton Harrox 2 (Steadman, Woods); Peterborough Sports Res 4 (McManus 2, Eldridge, Barron), Leverington Sports 1 (Webb); Warboys Town 3 (Brown, Duncan, Latchford), Holbeach United Res 4 (Chappell, Keeble, Simmonds, Storey) after extra time. Lincs Junior Cup: Skegness United 4 Stamford Lions 3 (Ball 2, Sheehan); Crowland Town 4, North Thoresby 3; Long Sutton Athletic 5 (Gosling 3, W. Oliver, Murrell), Fishtoft 0.